If you are on a mission to get fit and healthy, you know that eating healthy food is a must to achieve that. You nutrition is actually more important than your workout plan. It counts for 80% of the results. This fact is probably why most people either can’t see results no matter how many spin classes they go to and end up quitting. When I explain this to people, the first thing that comes out of their mouth is always “I can’t really afford healthy food”, or “I don’t have time to cook everyday”, or “I am not really a great cook”. While all of these may sound like excuses (some of them really are, hate to be harsh), some people really feel that way. It is a real issue for most of us. 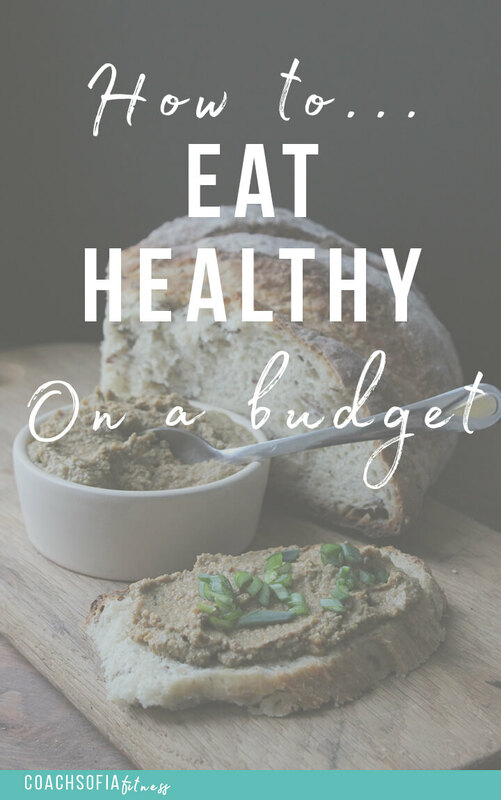 So I felt the need to write a post about eating healthy on a budget, and how to structure your meals. Are living on a tight budget and don’t know how to shop for healthier foods without breaking the bank. Are relying on fast food, packaged food and quick meals to get through the day because you work from 9-5, are a student, or have a family and can’t find more time in a day to allocate to grocery shopping, cooking and meal preparation. First of all. I want to let you know that I understand the struggle. Once you make that decision that you want to get healthy and fit, you feel completely lost and overwhelmed about what it takes to get to that goal. I have to say that it is not an easy thing, at least at the beginning, but it is totally WORTH IT. You will face some challenges here and there, cravings, people will try to discourage you (because you make them feel uncomfortable) and you will have doubts and want to just go back to the “comfyness” of french fries and pizza everyday. The one thing I want you to know today is that, this preliminary stage won’t last forever. It only takes couple weeks until you start noticing how great you feel, and how your body is changing, for you to LOVE the healthy and fit lifestyle. So I want to help you today to make this process as smooth as possible. I noticed that many people are either resisting the change because healthy food is “expensive” or express their lack of time to handle all the cooking. Here is a cool exercise for you: Go to your bank account and see how much you have been spending on food the past couple months. If you buy packaged food notice how much that is costing you. Write those numbers down. Next, create a budget for your groceries. What I do is; I set a specific amount of money every month for groceries, and I divide it by 4 to get the weekly amount. That way it is easier to track. If I set $80 a week, and I spend $30 on groceries Monday, I know I have to be careful with the other $50. Monthly tracking never worked well for me. If you buy food frequently, and go out often, then you will quickly lose sight of how much you spent and how much is left. Schedule your grocery shopping trips: eating healthy on a budget will require you to grocery shop. I usually go twice a week just because I don’t like buying that much food that can go bad. Once a week also works. This way you are in control of your weekly expenses. Check out my post on how to grocery shop in 15 minutes or less. If you go shopping to buy food the whole month (which I see a lot of people do at the store), you will spend tons of money and most of the food will go bad in a week. I made that mistake before. I would also always forget an item, and would go back to the store the next day to pick up that item (and 10 more things that I realised I needed). I don’t want to get into the details of how to grocery shop effectively since I have a post just about that. When it comes to the foods you need that support your goals, there are simple steps you can follow to ensure you buy healthy food, without breaking the bank. Stick to raw food: vegetables, fruits, beans, meat, nuts, etc. Buy as minimum packaged foods as possible. Personally, I tend to buy the same type of foods everytime. This allows me to know relatively how much I will be spending every time and it helps me plan my meals easily. I will list the food I buy frequently to help you do the same. I usually split them into categories and I make sure I get at least one or two from each category. I never buy everything in one trip. It is important to keep your metabolism high and constantly using energy (burning calories). To do that, you need to consume small meals every 3 -4 hours. I usually have a morning snack and an afternoon snack. Apple slices and peanut/almond butter dip. Supplements should be taken as needed, only to supplement your current nutrition. The only supplements I take regularly are my vitamins, green drink and protein powder. I only take protein powder if I am busy and did not get a lot of protein that day, or following a workout. As you can see, most of the food I consume frequently are whole foods. I rarely buy anything that comes in a box. Boxed food is usually way more expensive, and not aligned with your weight loss or fitness goals. So while you may think it is “cheaper” and you need to “save up, you are actually spending more money in the long run. My typical grocery bill is below $80 for a week. Once I have my meals prepared I don’t have to worry about buying lunch at work. Imagine you buy a sandwich for $7 a day. 7 times 5 is $35 a week. That is excluding coffees, and snacks. If you are truly ready to change your body and get fit and healthy, you probably don’t even need me to try to persuade you into making your own food at home. You just know you need to do it to achieve your goals. This post was only meant to help every busy person eat healthier on a budget. First of all, I would like to discuss few things that turns people off the most when they hear “meal planning”. You probably think you will have to stand in the kitchen for two hours a day cooking, sucking up heat and preparing two sets of meals, one for you and another for your family. I drizzle olive oil and herbs to enhance the taste. While those are baking, I cut the lettuce and kale and put them in a container. This whole process takes me about 15 minutes, literally. After dinner time, I have so much food left for the next days to come. I put everything in small containers and pack them in the fridge. Lunch: I will have the same thing I had last night for dinner. I can also play with food combinations. I can skip the rice and just have the vegetables and chicken. Snacks: Since I don’t have to cook my snacks, I keep some of them at work, so they are easily accessible. I keep a bag of raw nuts there, and there is always some Greek yogurt and milk in the fridge. Simple. I always order half size. If I order full size I make sure to pack half of it for later. Usually the half size is more than enough for one person. I ask for the dressing, and sauce on the side. I avoid deep fried and breaded food. I always ask if the chicken or fish is fried. Sometimes the menu doesn’t specify that. I always ask if the soup has flour in it. I make sure to drink plenty of water before my meal. As you can see, eating healthy can be pretty cheap. You also don’t have to be a chef to make a decent meal. Focus on eating protein, carbs and healthy fats in every meal – as I showed you in this post (pick an item from each category) – and you have a healthy meal.